Posted November 1, 2016, in News. 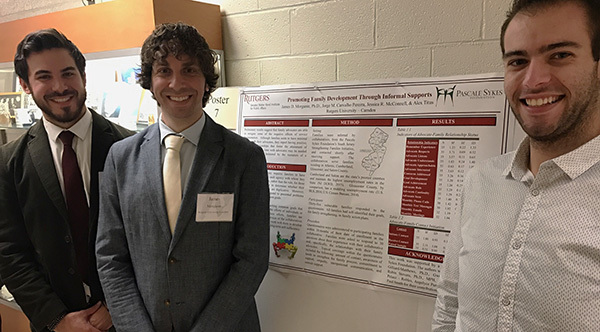 On Saturday, October 15th, WRI Research Analyst, Dr. James Morgante, and WRI student staffers Jorge Carvalho Pereira and Alex Titus presented at the 56th Annual Meeting of the New England Psychological Association. Their presented poster, Promoting Family Development Through Informal Supports, addressed families’ experiences with social service delivery collaboratives. This presentation was based upon preliminary findings generated from evaluative research funded by the Pascale Sykes Foundation. Traditional, service delivery requires families to have distinct relationships with each agency with whom they interact. It is the exception, rather than the rule, for those agencies to come together to determine whether their interactions with the family are duplicative. Moreover, service agencies tend to respond to presented problems rather than working on long-term goals. Collaboratives center on reaching common goals that cannot be achieved through the efforts of individuals or agencies alone. Through concerted efforts, families are connected to the network of resources available to the collaborative, all of which are aimed at fostering a family’s long-term self-sufficiency. Families’ experiences with their collaborative was assessed to determine the impact of collaborative structure on the achievement of identified needs and family development. Preliminary results suggest that collaboratives are able to mitigate some of the negative effects of service fragmentation. Moreover, families tend to report receiving the support necessary to achieve their self-identified goals. It is Dr. Morgante’s hope that this line of research will further the understanding of collaborative approaches to social service administration. This page was printed from http://rand.camden.rutgers.edu/2016/11/01/nepa-presentation/ at 4:21 PM Monday, April 22, 2019.